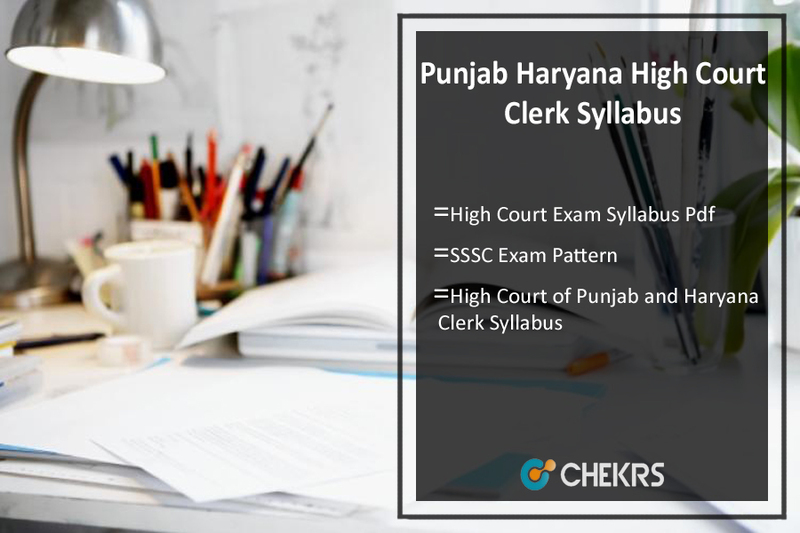 Punjab Haryana High Court Clerk Syllabus 2019 (पंजाब हरियाणा उच्च न्यायालय क्लर्क सिलेबस- एसएसएससी परीक्षा पैटर्न): The high court of Punjab and Haryana, Chandigarh has released the official notification on 05th January 2019 to recruits the candidates for the clerk Posts. Therefore candidates who will complete their online application form can download the Punjab Haryana High Court Clerk Exam Syllabus. The exam process will be conducted in the month of April/May 2019. Candidates are informed that they can start their exam preparation with the help of exam Syllabus Pdf and also get the High Court of Punjab and Haryana Clerk Exam Pattern from here. Several candidates apply for the various Government Jobs every year. Applicants who want the Clerk Posts in the Punjab and Haryana High Court can check the Punjab and Haryana High Court Clerk Syllabus Pdf to begin their exam preparation. The exam syllabus and pattern will help the candidates to know all topic which will be covered in the exam. The Clerk Exam is scheduled to held in the month of April/May 2019 and all the participate candidates are busy with their exam preparation. The Punjab Haryana HC Clerk Syllabus is available here which has been divided according to the Papers or subjects. All the candidates are informed that they should check the complete details of clerk syllabus and Exam pattern before the exam study. The Chandigarh High Court Clerk Syllabus will help the candidates who are preparing for the Clerk Written Examination to get the familiar with the topic of each section of the exam. The clerk Examination will consist the Descriptive type and Objective Type Question Papers. Applicants who will qualify the written examination, the number of candidates as decided by Hon’ble the Central Recruitment Committee may be called for the computer proficiency test i.e. to access the proficiency of candidates in operation of the computer (word processing and spreadsheets). So check the Punjab and SSSC Haryana HC Clerk Exam Syllabus Pdf Details. General Knowledge Current Affairs – National & International, History – India & The World, Indian Geography, Indian Polity, Geography, Indian Economy, Indian Constitution, Science & Technology, Environmental Issues etc. English Composition Vocabulary, Antonyms, Synonyms, Grammar, Comprehension, Fill in the Blanks, Transformation of Sentences, Usage of Words, Idioms & Phrases, Tenses etc. The written examination may be conducted at the examination centers located in Chandigarh, Mohali or anywhere in the State of Haryana. ‘General Knowledge’ paper will be evaluated. There will be negative marking in multiple choice questions. For every wrong answer, the 1/5th mark would be deducted. The question(s) not attempted will receive no credit or discredit. English Composition’ paper will be evaluated only of those candidates who qualify the ‘General Knowledge’ paper i.e. obtain 33% marks in ‘General Knowledge’. However, no candidate shall be considered to have qualified the written examination unless he obtains 40% marks in the aggregate of both subjects. The Punjab Haryana High Court Clerk Syllabus 2019 has been released for the available posts. Therefore preparation can become easier with the help of Clerk Exam Syllabus. Hence you can go through all subjects and topics of Clerk exam provided above. To receive more updates on Latest Chandigarh High Court Clerk Exam Pattern keep visiting our site www.jobs.chekrs.com. We will provide you the latest alerts on Public Service Commission Jobs. In case of any query or review, you can place your valuable comments in the commenting section below. We will revert you in a short while.